The Sony Cyber-shot HX99 offers a 30x optical zoom lens, a pop-up electronic viewfinder, and a 3inch tilting touch-screen in one of the most compact travel zoom cameras available, but is it any good? The Sony Cyber-shot HX99 is the the smallest travel zoom camera available with a 30x optical zoom lens, and with 4K UHD video recording, and a built-in electronic viewfinder it packs a lot into a small package. However the high price, and relatively average image quality may put many off. 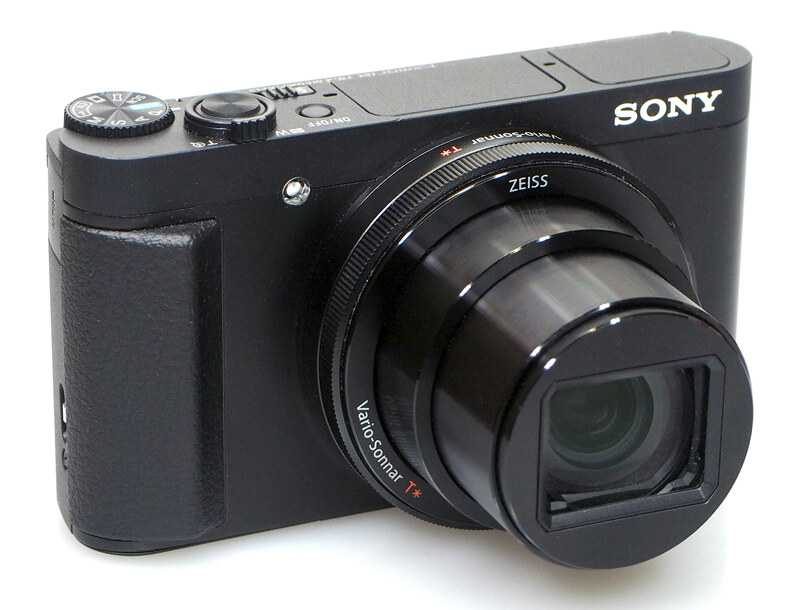 The Sony Cyber-shot HX99 is a compact travel zoom camera, with an impressive 28/30x optical zoom lens*. It updates the HX90, with 4K video, raw shooting, and has eye focus AF, a touch screen, and there's 10fps continuous shooting, plus a control ring around the lens. 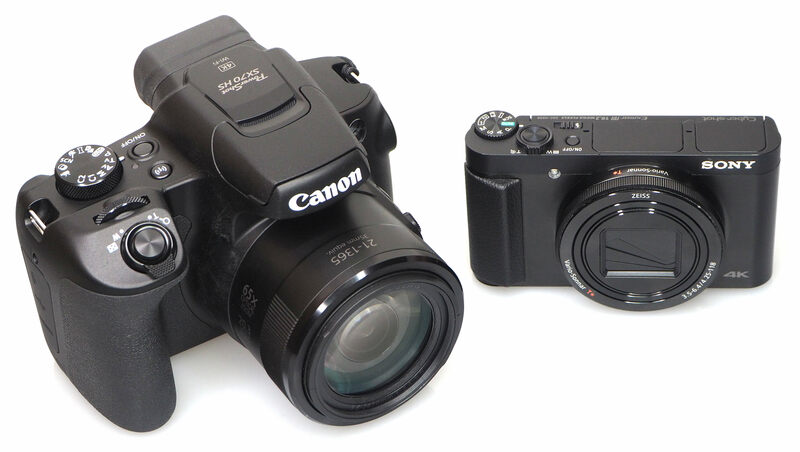 The HX90 started as the most compact 30x travel zoom camera available, and the HX99 continues that tradition. 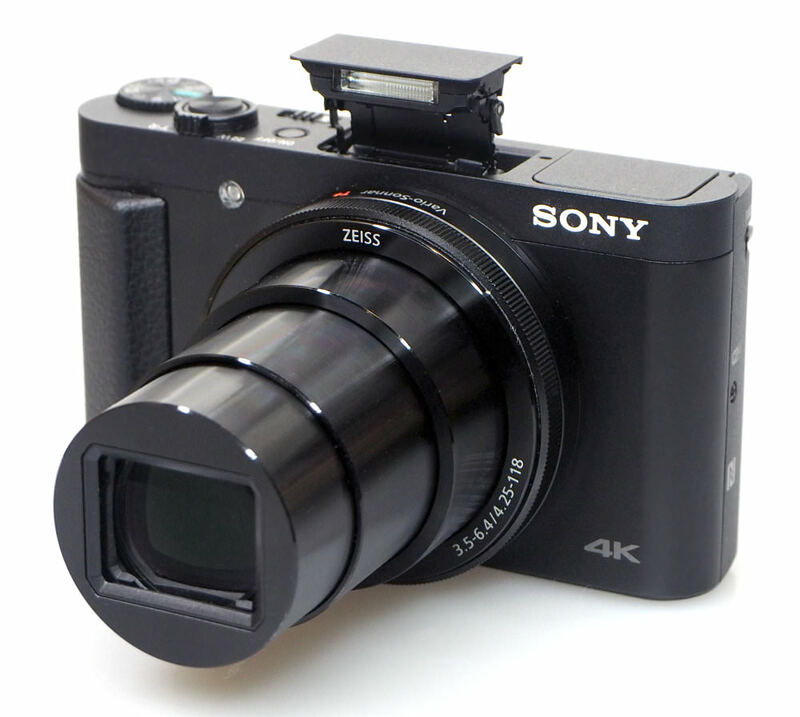 *Technically the camera has a 28x optical zoom lens (4.25-118mm is 28x, and 28x optical zoom is specified on the Sony website), yet the camera still covers 24-720mm equivalent range giving you a 30x optical zoom. 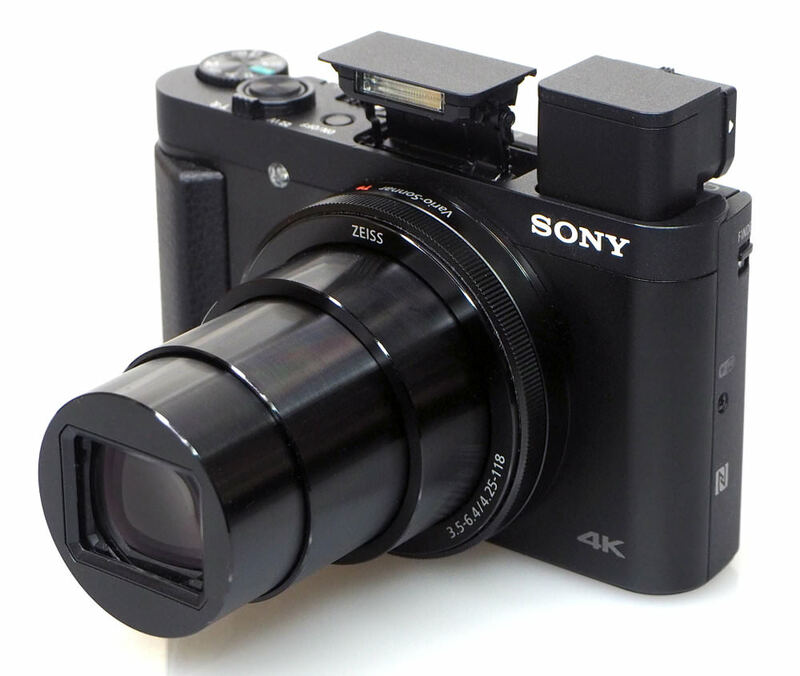 The Sony Cyber-shot HX99 is for those who want a lot of optical zoom, but don't want the added size of an ultra-zoom bridge camera - as can be seen below, the Sony Cyber-shot HX99 is considerably smaller than an ultra-zoom bridge camera. Giving 30x optical zoom lens (equivalent), the camera offers the equivalent of 24mm zooming all the way to 720mm in a compact camera body. Optical Image Stabilisation is included to help keep shots sharp when using the optical zoom, or when shooting in less than ideal lighting conditions. The camera features a built-in pop-up flash, a pop-up electronic viewfinder, and a tilting 3inch touch-screen that can be tilted forwards for selfies and group shots. 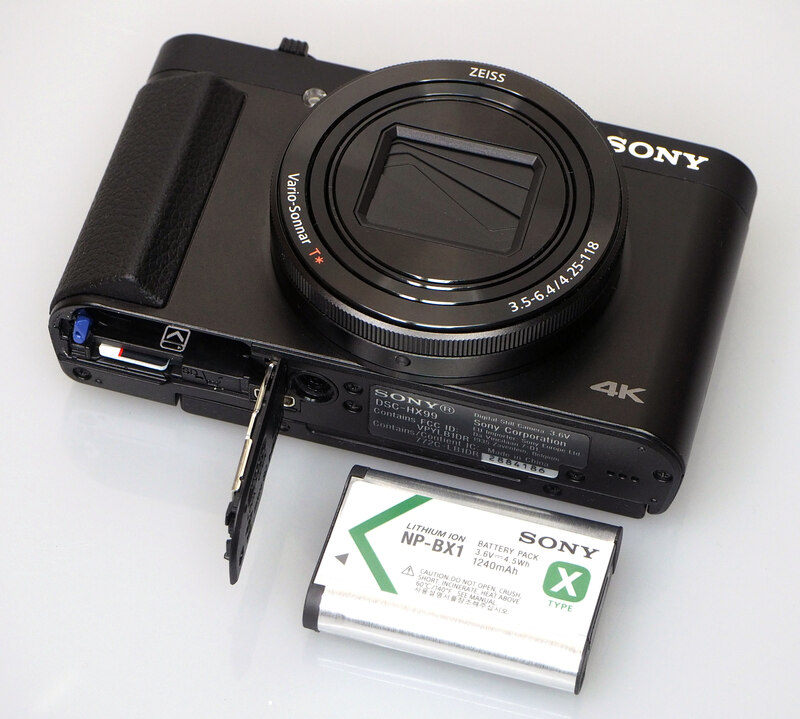 The Sony Cyber-shot HX99 is the most compact of these, measuring 102 x 58.1 x 35.5mm, and weighing in at 242g it is also the lightest of these. There's an 18mp BSI CMOS sensor, offering not only high-speed continuous shooting (at 10fps), but this also offers high-speed video recording. The camera offers P, A, S and Manual controls, as well as a range of automatic and scene modes. The camera now offers raw shooting, so you can process the raw images yourself if you want to. On the back is the 3inch touch-screen with a resolution of 921K dots, this can be tilted forwards for group shots, or selfies. 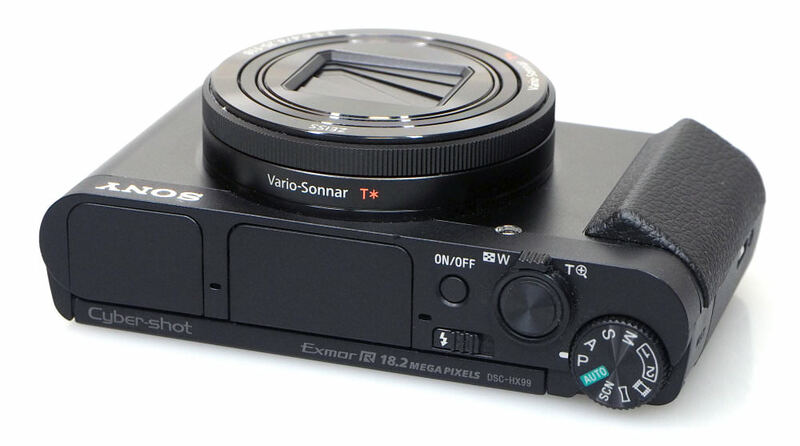 The electronic viewfinder (EVF) that will also act as an on / off switch when popping up, and down to switch off. The camera offers 4K UHD video recording, with stereo mics built-in, and you can use the optical zoom while recording. FullHD video can be recorded at a variety of speeds, up to 120fps. Wi-Fi, NFC, and Bluetooth are built-in. NFC helps you quickly set up a connection to a compatible smartphone. Wi-Fi can be used to remotely control the camera, and Bluetooth means you can transfer images using less power than Wi-Fi. The camera is compact, being one of the smallest travel zoom cameras available, and weighs in at 242g with battery and memory card. It's easily pocketable, fitting into trouser pockets. The camera body is mostly made out of metal, and this gives the camera a solid, premium feel when you pick it up. The pop-up flash and pop-up have reassuringly solid construction, so there is nothing to worry about when it comes to build quality. There's a rubber grip on the front to aid with holding the camera securely. On the back is a very small rubber area for your thumb to grip on to. We'd definitely recommend using the provided wrist strap to ensure that you don't accidentally drop the camera, as the camera is still small, even with the rubber grip at the front. 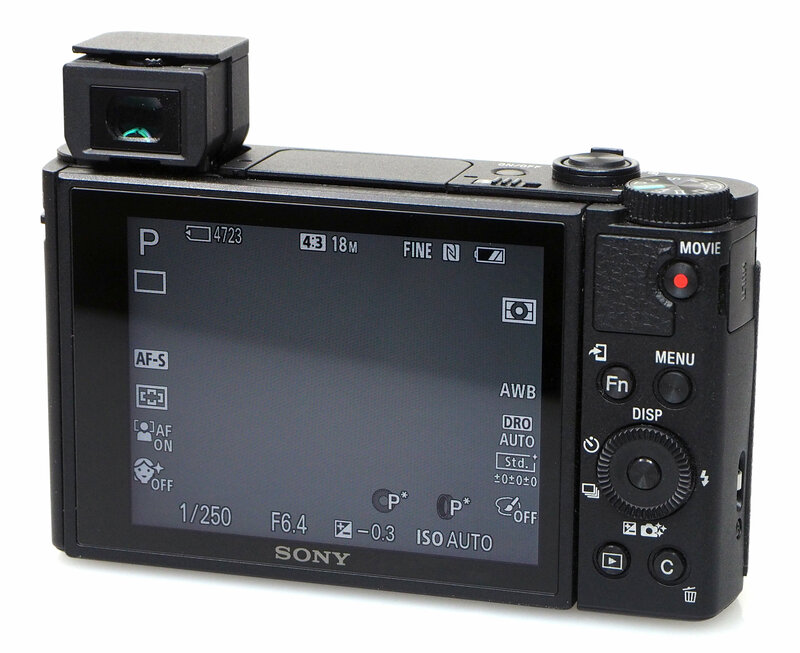 On top of the camera, you'll find the mode dial, on/off button, zoom rocker and shutter release button. A switch is used to release the pop-up flash. There are two custom modes available on the mode dial (1) and (2). To release the pop-up electronic viewfinder (EVF) there is a switch on the left-hand side of the camera, once it pops up you then pull it towards you. To close you reverse the steps. There's dioptre correction. The electronic viewfinder is a decent size considering how small the camera is, at 0.5x magnification, it gives a reasonable view, and looks good. 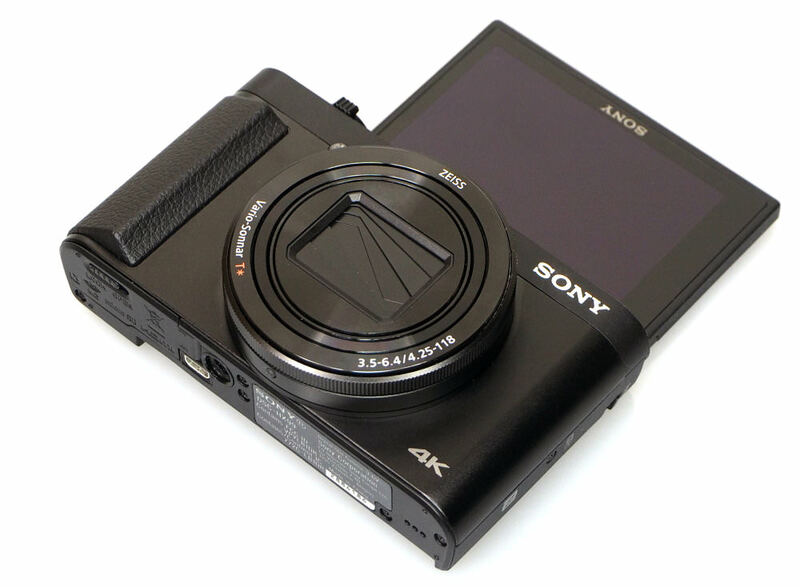 Menus – The menus are similar to Sony Alpha cameras, which means you should be able to find your way around if you've used other Sony cameras. There's even a "MyMenu" screen where you can add your own favourite settings, making it quicker to find your favourites. The Fn button gives quick access to on-screen controls, and these can be customised. The 3inch touch-screen has a decent resolution of 922K dots, giving a clear view. You don't need to use the touch-screen, as you'll find you can use all of the controls and buttons on the back of the camera if you want. However, the touch-screen can come in handy if you want to quickly set the focus point. If you're shooting outdoors in bright sunshine, the screen visibility is still quite good. However, for a better view, you can use the pop-up electronic viewfinder (EVF), which also has dioptre correction available. The view is good, with good colour reproduction that matches the screen. Battery life - USB charging is available, using the MicroUSB socket, and battery life is rated at 370 shots, or up to 460 shots if you set the auto monitor off setting to 2 seconds. If you use the viewfinder then battery life is rated at 300 shots. Depending on your planned use, you may want to purchase a spare battery. The camera works well in low light at low ISO's. Of course that would require supporting the camera in some fashion. Carrying a tripod defeats the purpose, of course, for carrying a small camera. Creativity (or in my case, sometimes a beanbag) let's me figure out a way to stabilize the camera under less than optimal conditions. When I do travel with my full-frame equipment, I often have a tripod with me. If I don't want to carry a huge telephoto lens, then I don't mind bringing along my own HX90v for times when I want a super-zoom lens. The largest prints - metal prints - I've made with the HX90v are 8x12 inches. They look fine to me. Most of my photos, though, go online. The camera works well in low light at low ISO's. Of course that would require supporting the camera in some fashion. Carrying a tripod defeats the purpose, of course, for carrying a small camera. Creativity (or in my case, sometimes a beanbag) let's me figure out a way to stabilize the camera under less than optimal conditions. When I do travel with my full-frame equipment, I often have a tripod with me. If I don't want to carry a huge telephoto lens, then I don't mind bringing along my own HX90v for times when I want a super-zoom lens. The largest prints - metal prints - I've made with the HX90v are 8x12 inches. They look fine to me. Most of my photos, though, go online.